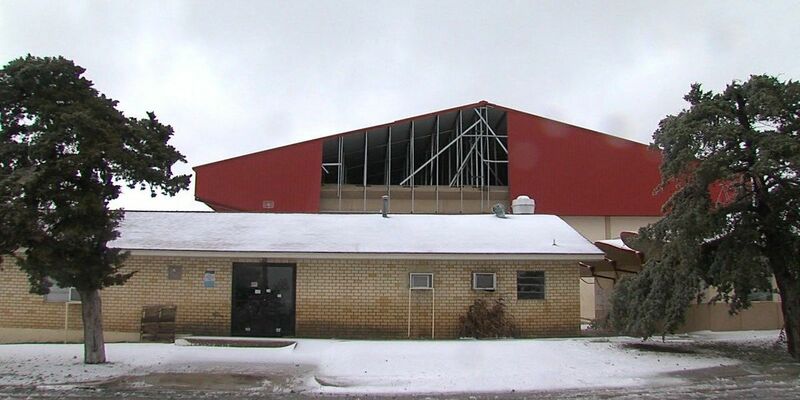 INDIAHOMA, OK(KSWO)- Sunday's strong winds knocked down several power poles outside Indiahoma, and also damaged the school gymnasium. One pole fell onto Cache Road west of Indiahoma, prompting road crews to close the road. However, at one point, the strong winds blew the barricades off the road, and into a nearby field, in spite of being weighted down by sand bags. Comanche County Commissioner Don Hawthorne said his crew has been out since 8 Saturday night, when their first call came in about trees and power lines blocking the road. He said they have lost count of how many trees and debris they have had to remove from the roadways since then. Road crews will be back out on the roads Sunday night to determine if they need to lay sand down. If they do, the trucks are ready to go.